In the year 1990 July 16, I remembered vividly at a very young age how the killer earthquake tore the city down and killed thousands. It was a tragic moment painted in my memory from that day to this very moment. I will never forget that feeling and knowing that when everything was falling apart and there was nowhere to run. The feeling that life is being slowly being taken from you. But surviving it is one thing, living through it all these years is another thing. But knowing that your family, friends, loved ones and even people across the world reached out to you, your people and your country not only uplifted our spirits, it gave us something more – HOPE! Hope that we can do it, we can make it through and we will be able to stand up again. 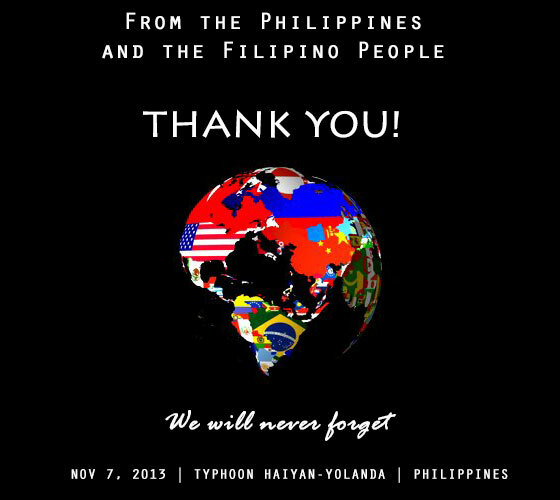 Two decades later and once again, I have witnessed the world coming together as one nation in solidarity with the Philippines having been affected by the super typhoon (hurricane) Yolanda, internationally known as Haiyan. The out pouring support, prayers, good thoughts, aid – both financial, humanitarian and in kind are not just heartwarming but overwhelming. It is yet again, another way of showing that there is indeed good in people. All these together showed me that we can be one nation, we can be there for our people no matter the race, the distance and culture differences! 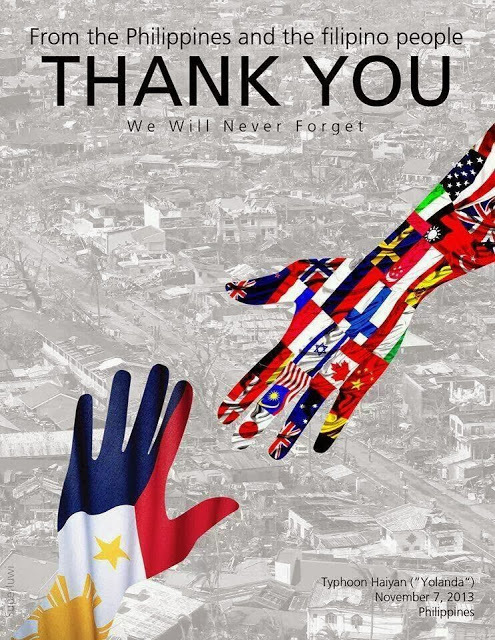 Let me say it once again, thank you World, thank you to ALL OF YOU who in one way or another contributed to assisting and lifting up the Philippines and the Filipino spirit! Disclaimer: Photos are courtesy of Philippines supporters and are not the author’s. We here in Hawaii have a special love for all the people in the Philippines and wish you every success in your recovery. I want to thank you for liking “River Congo – Excerpt 16” on papermudandme.wordpress.com. I wrote those books to show in a small way the agony that is still part of the Congo and much of the rest of Africa. Blessings and Aloha – pjs. A million thanks from me and my fellowmen! Every kind and loving heart is praying for the Philippines to recover and for the victims and their families.Great post. Thank you so much. Those good thoughts and prayers mean a lot. Hi, we wanted to use the photo above for thank you card to our donors in our fundraising, is it okay?